Over the last few years, a new and revolutionary approach to biotechnology innovation has emerged. Synthetic biology promises to radically restructure many existing industries and to create significant new ones. The global market for synthetic biology is expected to reach $16.8 billion by 2020, driven by expanding commercial applications in end-use sectors such as energy, medicine, environment, agriculture, and chemicals. This article will assess the state of synthetic biology innovation in the U.S. and discuss how federal R&D tax credits can favor the advancement of this revolutionary field of research. The rapidly evolving field of synthetic biology is based on the application of engineering principles to the fundamental components of biology. It can be broadly defined as, “an emerging area of research that enables the design and construction of novel artificial biological pathways, organisms, or devices, and the redesign of existing natural biological systems." In other words, synthetic biology is an effort to develop better tools and technologies for engineering biological systems, with the overarching goal of creating new biological functions and enhancing existing ones. By manipulating genetic information, synthetic biology focuses on the design, construction, and transformation of core components (such as parts of enzymes, genetic circuits, metabolic pathways, etc.) that can be modeled, understood, and adjusted to achieve specific performance criteria. These smaller parts and devices are then assembled into larger, integrated systems designed to solve specific problems. Different from many other areas of engineering, however, the design of new and enhanced biological systems involves non-linear and rather unpredictable interactions. Thus, the outstanding challenge is to create a set of design rules that organize and recast the overwhelming physical details of natural biology. I. DNA sequencing allows researchers to read genetic material and convert information encoded within DNA molecules into sequence data. Sequencing technologies have greatly contributed to an increased understanding of the components and organization of natural biological systems. II. DNA transformation consists of different methods for the manual editing of DNA and its subsequent incorporation into living organisms. Examples include the use of restriction enzymes to sever DNA strands at specific sequences. The isolated snippets of DNA can then be inserted into other DNA strands. III. DNA synthesis allows biologists to write genetic material from scratch. Unlike molecular cloning or polymerase chain reaction, artificial gene synthesis does not have to begin with preexisting DNA sequences. Synthesis technologies have enabled the design of new, synthetic biological parts and systems. 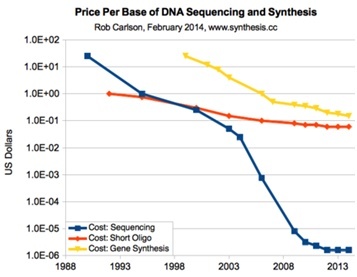 Over the last few years, the cost of commercial gene synthesis has plummeted, leading to considerable advances in related research. With current technology, scientists are already able to design a complete genome, output it, and insert it in a cell. Arguably, they are creating new life from scratch. IV. DNA programming, or the development of a programming language for living cells is similar to the languages used to program computers and robots. The ultimate objective is to create both a high-level grammar that allows programmers to describe a desired function and the computational methods necessary to convert this language into a linear DNA sequence. The resulting sequence is then built and inserted into an organism, which runs the program. In order to facilitate genetic programming, researchers are developing banks of standardized DNA sequences, each responsible for performing specific functions. The most commonly used standardization framework consists of the so-called BioBrick parts, or functional sequences of DNA with uniform prefixes and suffixes. By creating a structural standard, BioBrick sequences can be linked together and act as interchangeable parts. Through all of these processes and technologies, researchers are continuously developing and enhancing a synthetic biology “toolkit” that enables the design and fabrication of biological parts, devices, and systems that would not otherwise occur in nature. The results are enhanced, innovative products across various industries. Synthetic biology enables the engineering of organisms that produce useful chemicals from inexpensive, renewable starting materials. The most prominent synthetic biology success story is the production of semi-synthetic artemisinin, an antimalarial drug. Though highly effective - largely responsible for a 25 percent reduction in deaths from malaria between 2000 and 2014 - the supply of natural, plant-derived artemisinin is highly unstable because of the uncertainties associated with crop success. Searching for an alternative to the costly and time-consuming production of the antimalarial drug from sweet wormwood seed, researchers from the University of California, Berkeley, resorted to synthetic biology. They changed the metabolic pathways of the yeast so that it produces artemisinic acid, which can be easily converted to artemisinin. In 2013, pharmaceutical company Sanofi began the large-scale production of semi-synthetic artemisinin from engineered yeast. The time, cost, and environmental gains of this innovative technique have lead to increased accessibility to this much-needed treatment and have shed light on the potential benefits of synthetic biology. The following sections explore some of the key applied market areas for synthetic biology. I. Medicine: The ability to use synthetic biology parts as “programmable entities” can revolutionize the medical world. It can enable new biotechnology processes that are more likely to promote innovation, accelerate discovery, reduce clinical failures, and ultimately be more cost-efficient. Stem cells, for instance, can be programmed to self-organize and differentiate to form tissues and organs. Viruses and bacteria can be enabled with “seek-and-destroy” programs and act as highly effective antibiotics. Likewise, the sensing and computing capabilities of bacteria can be used to convert them into targeted drug delivery devices, capable of identifying diseased cells and specific regions of the body that need treatment. Synthetic biology can also help unveil the potential of microbiome-based therapies, which explore the symbiotic relationships between the human body and the immense community of microbes it hosts. In February 2014, MIT’s Synthetic Biology Center announced a three-year research collaboration with Pfizer, Inc. designed to capitalize on leading discoveries in synthetic biology to advance drug discovery and development technologies. The joint effort is expected to unveil better ways to manufacture drugs and to reduce the cost of making some of the most complex types of biological treatments. The so-called biologics, or large molecule drugs, are medications derived from living material - human, animal, or microorganism. Generally speaking, biological medicines present better long-term treatment outcomes with fewer side effects than traditional drugs, often resulting in abbreviated recoveries. However, the production of such drugs remains costly and time-consuming. By harnessing advances in genomic sequence and bioinformatics, synthetic biology can help change this scenario. The development of new, synthetic versions of existing drugs can also be a major contribution of synthetic biology. Researchers from the University of North Carolina and the Rensselaer Polytechnic Institute, for instance, have created a simplified version of heparin, a largely used anticoagulant. In addition to having drastically fewer steps to produce than the only existing synthetic heparin in the market, the new version is safer than the natural drug, which is extracted from tissues of cows and pigs and therefore highly susceptible to contamination. Finally, synthetic biology can help overcome some of the most pressing challenges in public health. MIT engineers have recently developed two novel strategies for combating drug-resistant bacteria, or superbugs that infect more than two million people nationwide every year. The first method uses a gene-editing mechanism to selectively kill bacteria carrying harmful genes that confer antibiotic resistance. The second consists of identifying combinations of genes that work together to make bacteria more susceptible to antibiotics. II. Environment: Synthetic biology can be the key to addressing major environmental concerns, such as water shortage and pollution. For instance, synthetic life forms could be at the basis of innovative water decontamination systems. Based in La Jolla, California, Synthetic Genomics, Inc. aims at harnessing microbial fuel cell technology as a biological system to clean water and generate electricity. When consuming the waste materials found in water, the bacteria produce electrons and protons. The voltage that arises between these particles generates energy. Meanwhile, the water itself becomes purified. Synthetic Genomics’ Aquacela initiative has conducted several successful test programs in a variety of wastewater streams including brewery waste and wastewater from a sanitation plant. Similarly, synthetic microbes capable of “eating” waste oil and removing poisonous chemicals and heavy metal pollutants could revolutionize our ability to deal with toxic spills and waste dumps. The process of bioremediation gained attention in the 2010 Deepwater Horizon oil spill in the Gulf of Mexico. Thanks to the natural occurrence of oil-gobbling bacteria in the area, the majority of BP’s oil was quickly cleaned up. Ongoing research has used genome-sequencing technology to enable a better understanding of the mechanisms that allow bacteria to metabolize hydrocarbons. The findings could shed light on how to optimize conditions for new, synthetic versions of these bugs, allowing them to perform more quickly and more stable than natural strains. Synthetic bacteria could be placed in affected areas that are not as naturally endowed as the Gulf of Mexico. III. Agriculture and Nutrition: Synthetic biology promises to pave the way for revolutionary agricultural discoveries. In addition to improving crops and reducing the need for pesticides, emerging technology could contribute to greater food security and enhanced nutrition. Agriculture is one of the biggest drivers of environmental impacts on the planet, occupying about 40 percent of Earth’s ice-free landscape and accounting for some 70% of water use. Expected demographic growth as well as the imminent intensification in climate change should place tight constraints on food systems around the globe. In this context, synthetic biology stands out as a strategic alternative. Genetically engineered plants are probably the most well known example. Precision breeding, a technique that identifies the genetic cause of a desirable trait and reproduces it, has been widely used to promote disease and flood resistance, or to ensure a certain color or sugar content. Headquartered in Chicago, Illinois, Chromatin, Inc. focuses on sorghum, a high-yielding, nutrient-efficient, and drought tolerant crop that could be vital to meeting the world’s growing demand for sustainable agricultural systems that can be cultivated on a variety of agricultural lands. With a state-of-the-art breeding program, the company develops and sells high quality hybrid sorghum seed from a proprietary and commercially-validated sorghum genetic pool. By combining sorghum varieties with diverse traits, Chromatin develops and customizes new seed products for a wide range of purposes, including animal feed, use in gluten-free food, and conversion into chemicals, materials, or fuels. With synthetic biology, researchers are no longer limited to the reproduction of what is already occurring in nature. They can create DNA from scratch and design specific traits. For instance, the development of biological sensing and circuitry could enable agricultural organisms to sense and respond to their environment. In other words, synthetic biology could create “smart” plants programmed to identify and respond to multiple threats, including pathogens, toxins, desiccation, and nutrient availability. This would be possible through the engineering of microbes in the rhizome, which could be programmed to perform such functions. Synthetic biology could also contribute to enhanced nutrition. With operations in New York, San Francisco, and San Diego, Swiss company Evolva uses biosynthetic and evolutionary technologies to create and optimize small molecule compounds and their production routes. Its objective is to provide innovative, cost-effective, and sustainable ingredients for better human nutrition. With groundbreaking technology, the company modifies yeast cells enabling them to produce existing compounds in disruptively new ways, or to make new compounds that were previously out of reach. Evolva’s proprietary, fermentation-based platform has been used to produce Resveratrol, Stevia, Saffron, and Vanilla. In other words, the combination of synthetic biology and materials sciences can enable the development of innovative materials with genetically encoded properties. This is particularly true in the context of nanobiomaterials, which are synthesized across different biological species, from bacteria to animal. Synthetic biology promises to transform engineered biological cells beyond their role as metabolic catalysts in the production of simple organic molecules, allowing them to serve as cellular foundries and nanofactories. Through a process of enzyme-directed bio-mineralization, for instance, it is possible to produce nanoparticles with unique structural and functional properties that are difficult to obtain by chemical routes. These particles can be used in a wide range of technologies, such as electronics, photonics, MEMS, catalysis, and energy production and storage. One example is the manufacturing of nanofibers that are genetically programmed for specific functions, such as adhesion to substrates, nanoparticle templating, and protein immobilization. Researchers from Harvard University and the MIT have worked on the development of programmable biofilm-based materials from engineered curli nanofibers found in E. coli biofilms. Biofilms consist of any group of microorganisms in which cells stick to each other on a surface. Even though they are typically thought of in the context of infectious diseases, where they provide a protective community for bacterial cells, biofilms can be useful tools for material science and nanotechnology. This is particularly true for curli nanofibers, which can contribute to the formation, patterning, and assembly of nanomateirals. Using synthetic biology technology, researchers were able to design a synthetic genetic circuit that controls the biogenesis of curli nanofibers. By attaching the resulting material to inorganic nanoparticles, they were able to create a functional, conductive biofilm-based nanowire. This innovative nanomaterial system could be applied to bioelectricity, biosensing, and bioelectrosynthesis uses. Generally speaking, engineered biofilms could become central to biomedicine and nanotechnology applications. V. Bio-Based Chemicals: From biodegradable plastics to plant-based cleaning supplies, the bio-based chemicals industry represents new, eco-friendly consumption alternatives. With significant growing prospects, this high-demand industry promises to introduce inventive ways to decrease our dependency on limited natural resources and lower greenhouse emissions, all of which using synthetic biology processes and technologies. According to the U.S. Department of Agriculture, bio-based chemicals currently constitute over 10 percent of the chemicals market. Cargill and McKinsey & Company believe that there is potential to produce two-thirds of the total volume of chemicals from bio-based material, representing over 50,000 products and a $1 trillion annual global market. Most of the growth should occur in specialty chemicals and polymers. Microbial chemical factories, in particular, provide a renewable pathway to pharmaceuticals, specialty, and commodity chemicals. The expansion of DNA sequence databases has helped scientists construct new pathways to desired chemicals. They use bioinformatics and DNA synthesis to identify, access, and assemble the correct enzymes that function together to convert a metabolite into a desired chemical. Headquartered in Englewood, Colorado, renewable chemicals company Gevo has developed bio-based alternatives to petroleum-based products using a combination of synthetic biology and chemistry. The company focuses on isobutanol, a naturally occurring four carbon alcohol with broad applications in many chemicals markets. Gevo’s Integrated Fermentation Technology® (GIFT®) is based on a proprietary yeast biocatalyst, which converts sugars derived from multiple renewable feedstocks into isobutanol. The resulting product is a promising alternative to petroleum-derived raw materials, with potential advantages in cost, predictability, and life cycle profile. Isobutanol can be dehydrated to produce butenes, which are building blocks for the production of materials such as lubricants, synthetic rubber, PMMA, propylene, xylene, and PET. In addition to plastics and fibers, potential markets also include solvents and coatings. Gevo has worked with The Coca-Cola Company to create renewable packaging from isobutanol. With a global market of approximately $100 billion, PET plastic is an iconic illustration of the huge potential behind bio-based chemicals. VI. BioFuels: In a context of limited natural supply of fossil fuels and growing environmental concerns, synthetic biology can enable the development of alternative energy solutions. It emerges as a strategic tool for the biofuel industry to develop, optimize, and mass-produce new, renewable energy sources. In 2013, Renewable Energy Group acquired LS-9, Inc. for $40 million, and an additional $21.5 million if technology and production milestones were met. Now known as REG Life Sciences, the San Francisco-based company aims to create an industrial biotechnology platform for the cost competitive production of sustainable products for the fuel market. REG Life Sciences has developed proprietary biological catalysts that selectively convert abundant renewable feedstocks, such as corn and cane sugars, directly to drop-in and differentiated products. To create these catalysts, the company applies synthetic biology to combine the highly efficient metabolism of microorganisms with new biocatalytic capabilities engineered into each cell. REG Life Sciences’ innovative single-step fermentation process can be found at http://www.reglifesciences.com/technology/technology-overview. Listed among MIT Technology Review’s 50 Disruptive Companies, Amyris has engineered yeasts that convert sugars into a hydrocarbon molecule called farnesene. If hydrogenated, the hydrocarbon can be turned into a diesel fuel that burns cleaner than conventional diesel, reducing emissions of sulfur, nitrogen oxides, and particulates. Unlike ethanol made from sugarcane or corn, Amyris's diesel fuel can be distributed through the same pipelines as conventional fuels. It can also be pumped with existing fuel pumps and used in conventional vehicles. The Emeryville, California-based company has partnered with Total to develop an alternative aviation jet fuel that is compliant with Jet A/A-1 fuel specifications and outperforms conventional petroleum-derived fuel in a range of performance metrics. In 2014, the renewable jet fuel received regulatory approval for key U.S. and European markets. The rapidly evolving field of synthetic biology can greatly benefit public health and promote economic development. However, the biosafety and biosecurity concerns surrounding this nascent field must be addressed. According to a recent report by the National Science Advisory Board for Biosecurity , biosafety concerns refer to the necessity of policies, practices, equipment, facilities, and medical treatments designed to protect workers and the environment from the accidental exposure to hazardous laboratory agents and materials. Concurrently, biosecurity concerns call for the protection, control of, and accountability for high-consequence biological agents and toxins, and critical relevant biological materials and information, to prevent unauthorized possession, loss, theft, misuse, diversion, or intentional release. The concept of “dual use research”, an aspect of biosecurity, is central to synthetic biology. It refers to the potential for misuse of scientific information to threaten public health, animal or plant populations, or other aspects of national security. Examples include the deliberate creation of novel pathogens, enhancement of the pathogenicity of a naturally occurring pathogen, and the re-design of a non-pathogen into a pathogen using synthetic biology technologies. Tackling these concerns may be more challenging than expected. Large numbers of synthetic biology practitioners come from backgrounds that are not traditionally considered life sciences or lack formal institutional affiliations. Thus, existing biosafety and biosecurity paradigms, which are aimed at life sciences research conducted at universities and research institutions, leave considerable gaps in oversight. Industry and regulators must work together to create an environment that guarantees biosecurity and biosafety without stifling beneficial innovation. The technological progress driving synthetic biology advances is central to overcoming both biosecurity and biosafety concerns. Synthetic biology is currently one of the most dynamic fields of research in life sciences. By offering a deeper understanding of biological processes and enabling the synthesis of new genes, biochemical pathways, and biological components with specified or novel properties, synthetic biology can lead to the creation of highly innovative processes and products across a wide variety of industries.